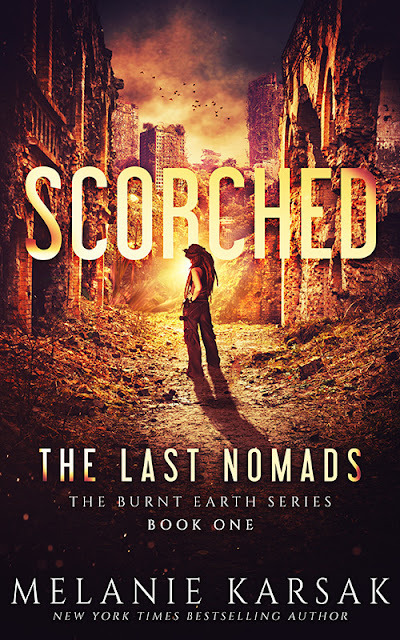 I'm really excited to share the Scorched: The Last Nomads releases this week! The novel is 99 cents for pre-order and during release week. This new look at the end of the world comes one-hundred and sixty-seven after a massive coronal mass ejection from the sun devastated out world. In my novel, Keyes, a resident at The Park, is struggling to survive. When her sister goes missing, she needs to decide if she should leave the safety of the walls to search for her. When I set out to write this book, I had intended a straight up post-apoc thriller. Well, I can never seem to stick to genre. The series has a Mad Max mixed with steampunk/solarpunk feel. Right now, the series is in a place where the world is very rusty and dusty, but by the end, we'll get a very different look at the world. I'll be blogging more about solarpunk and eco-criticism soon. But for now, let's enjoy Keyes' journey! The worn metal casing of the monocular burned the tender skin around my eye as I peered across the wasteland. The wind blew up a torrent of red dust that burned my nose. I stifled a cough. The windmill’s paddles turned, metal squeaking. I scanned the horizon. Nothing moved. Nothing lived. It had been eight days since Ash and her party headed out beyond the walls of The Park on a journey to Low Tide outpost. When the annual shipment of supplies had failed to arrive, my sister had led the expedition to find out why. The only problem was she hadn’t returned. I panned the lens toward the ruins of the city in the distance. We called the route between our two communities Hell’s Passage. Between the hostile landscape, daily temperature holding well above one hundred degrees, and the dangers inherent traveling through the fallen world, Hell’s Passage was the perfect name. This was the world Ash and I had been born into, a hell complete with its own demons. If the solar sickness or dehydration didn’t kill us, the wailers would. If Ash and her group had been caught out at night when the wailers roamed… No, I wouldn’t think like that. “Keyes?” Ronan called up from the ground. I lowered the lens and looked down from my perch on the watchtower at him. Ronan was still wearing his smock and goggles. His black hair stuck out wildly, the silver at his temples looking like wings. His forehead was wrinkled with frustration, his lips drawn into a tight line. “What’s wrong?” I asked. I slipped my monocular into my toolbelt. Grabbing a rope, I slid down from the watchtower to the ground. My boots landed with a thud, stirring up a cloud of dust. When Ash hadn’t returned on time, I’d started begging the elders to let me leave the safety of The Park to look for my sister. Their answer was a resounding no. But Ronan and I had cooked up a plan. Ash and her group had driven our landsailers down the dry riverbed toward the fallen city. Someone could go see if the ships were parked at the waterfall. That’s where they would have stopped. There was no way around the boulders. If the ships were there, at least we’d have some idea of how far they made it. Ronan pointed in the direction of Park Building. The building, which had once been the central hub of the natural park where our community resided, sat on a rise above the rest of the small village. One hundred and sixty-seven years ago, a massive coronal mass ejection from the sun had devastated the world. The grids went down. Technology buckled in the blink of an eye. We could have survived it, we could have rebuilt, but it seemed that humans did not fare well in the face of global natural catastrophe. Lawlessness ruled. The Park, which had once boasted small shops, tiny cabins, quaint cafés, and the administrative center—Park Building—became a refuge from the city. Walls had been erected to keep marauders out. But that was when mankind thought their biggest problem was one another. In the years that followed the solar superstorm, it became apparent that the earth had been doused with massive radiation. Crops failed, and people started dying of solar sickness. Worse was what had been born in the CME’s wake. Monsters that lurked only at night: the wailers. Now the walls kept us safe. But I had been trying to get outside those walls for days. Unfortunately, the elders’ second condition was about to ruin any chance I had of sleuthing. I shot Ronan a knowing glance. The elders knew me well enough to know that I wouldn’t be satisfied with only half the story. Enrique, leader of the watch and a very self-assured hardhead, was there to keep me in line. I sighed. “Okay. Well, we’ll have to take it, conditions aside. I’ll meet you in ten,” I said then headed off in the direction of the little house I shared with my sister. I worked quickly, packing up my tools. I also grabbed a map which I’d copied from Ash’s things before she’d left. I drummed my fingers on the paper. If they would just let me go alone. Frowning, I grabbed my goggles and a scarf. I cast a glance at Ash’s empty cot. With our parents gone, Ash was the only person I had left in the world. What did they expect me to do, just sit here and wait? What if she was hurt somewhere out there? Or trapped? I had this terrible feeling in the pit of my stomach that something was wrong. My sister was in trouble. I knew it. And she was still alive. What gave them the right to decide I couldn’t try to find her? Frustrated, I headed back outside where Ronan and the chronically-irritable Enrique waited. Enrique handed canteens to both Ronan and me then signaled to the guard on the gate. Metal screeched in protest as they unlatched the locks then turned the wheel to open the massive gates. Dust blew across the wasteland and into the community center. It burned my nose, and the taste of silt filled my mouth. I wrapped my scarf around my nose and mouth and lowered my goggles. The blue-green tinted lenses blocked out the harsh light. Something had happened to the Earth’s atmosphere in the wake of the solar storm. From what I had read in our small library, the Earth’s protective layers were supposed to keep out harmful radiation. But people were still getting sick. Maybe in another hundred years or so the Earth would heal herself. But by that time, humanity would be dead. Perhaps only the wailers would survive. “How far do you think they could get in the landships?” Enrique asked as we headed toward the dry riverbed. Ronan and I had worked for the last several months building ships that could travel quickly and easily across flat land. Fashioned from canoes fixed with wheels, sails, and a rudder—based on a design I’d seen of ships that used to race on the frozen lakes—the ships could quickly come up to speed. “About three miles downriver the terrain gets rough. If they managed around the rocks, they would have had to stop at the waterfall. No more than six or seven miles,” Ronan said. Enrique nodded then motioned for us to follow him. We walked to the riverbed and began our trek down the rugged landscape. I thought back to the day my sister had left. Ash had gone out with Lordes, Faraday, and Nasir, who loved my sister. All of them were strong. All of them had a reason to live. Something unexpected had happened. As we walked along the dry riverbed, I glanced at the shapes along the river’s edge. Dry brush and reddish vines with sharp thorns had overgrown what looked like nothing more than heaps along the river. Underneath were the ruins of houses. This area had once been picturesque, a beautiful community nestled against a lovely green park, a river running through it. There was a magazine in Park Building showing the hot air balloon festival that used to be held in the sunny meadows between us and the city. Hundreds of brightly-colored balloons would dot the skyline over the picturesque fields. Now there was nothing but thorny vines, dirt, and the wailers. We made our way quickly down the dry riverbed. As we went, I spotted a large brick building among the ruins. The vines had completely choked the structure. As we went, I watched for any sign of Ash and the others. The dust had long since blown away their tracks, and thus far, I had seen no sign at all. Enrique kept checking his timepiece. He was right to be cautious. We had to make it back before dark. We made our way quickly. As we went, I noticed the terrain growing increasingly rough. The landships could be steered, but between the boulders and the occasional rusted out car, they would not have gotten much further. It wasn’t long after that when we came to the dried up waterfall. “There,” I said, pointing to a rise in the river made of a mix of concrete and boulders. Beyond that, the river’s depth fell dramatically. On the riverbank nearby, I saw the ruins of several buildings, including one I knew to be an inn which had once enjoyed the picturesque view—before all the water had receded back into the depths of the earth. The landships were sitting beside the jumble of rock. Ronan and I rushed over to the ships. They had been carefully stashed, the sails lowered, parked in line. “She made it this far,” Ronan said, setting his hand on my shoulder. I looked through the ships. There was no sign of anything wrong. No scratches. Nothing broken. No blood. I exhaled deeply then climbed onto the rocks nearby. I scanned all around. On the bank near the riverbed below, I saw the dirt a hand had shifted, and rocks that had tumbled to the riverbed. Enrique and Ronan joined me. I pulled out my monocular and looked off in the distance. “Anything else?” Enrique asked. His voice had a hard edge to it, but I understood his apprehension. On his last trip out, Enrique was part of a group that had encountered trouble. They had lost someone on that voyage. He never ventured beyond the walls after that. “How far is it from here to the lighthouse?” Ronan asked, referring to the midway point between Low Tide and The Park. “Too far for us to be concerned with,” Enrique said, and then slugged some water from his canteen. Frowning, I pulled out my map. Enrique was right. It was too far for the three of us to travel before dark. “Leave them here. The others may need them when they return,” Ronan said. “The windows are open. They won’t be inside if there’s light,” I replied. “But—“ I began, but Enrique cut me off once more. We took a few moments more to drink some water. I couldn’t help but notice the strong taste of sulfur. The water in our reservoir was getting low. We had already started work on another deeper well, but so far, we hadn’t had any luck. Without the supplies from Low Tide to clean the water, we were in trouble. I took another sip of the smelly water then closed up the canteen. Looking just once more through my spyglass downriver, I eyed the city. The window panes on the upper floors of the tall buildings glinted in the sunlight. I winced.